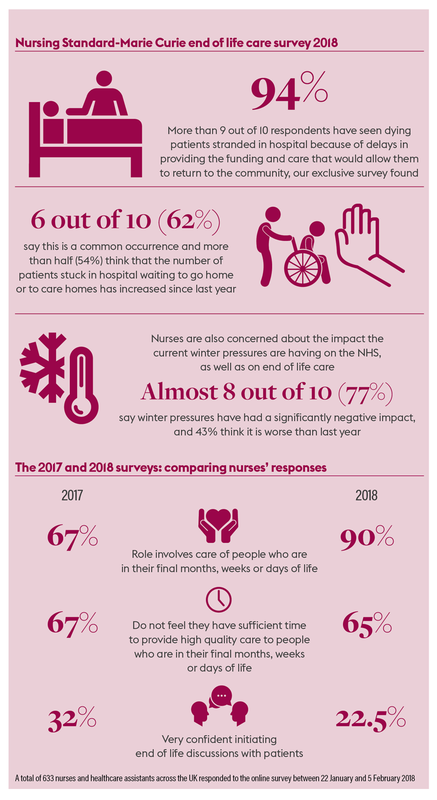 Our infographic reveals how more than nine in ten respondents to our exclusive survey have seen dying patients stranded in hospital because of delays in providing the funding or care that would allow them to return to the community. The 2018 end of life care survey conducted by Nursing Standard and terminal illness charity Marie Curie heard from more than 600 nurses and healthcare assistants. Of these, 54% say more end of life patients are stuck in hospital this year than last year due to lack of community care. Nearly two-thirds (65%) said they do not have sufficient time to provide good care for dying patients.